The National Collegiate Honors Council recognizes the diversity of honors experiences across many institutions of higher learning. 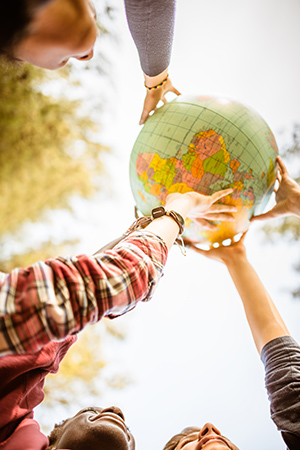 These institutions feature an array of missions, which honors programs and honors colleges strive to enact at a high level. While recognizing the inevitable differences that arise from these local contexts, NCHC has identified similar features within honors that occur regularly among these various programs, regardless of the variation within institutions. The document attached to this page elaborates this summary, including commonly sought and measurable honors outcomes, and describes "modes" of honors learning that are characteristically employed to foster these outcomes. Neither the outcomes nor the modes are presented as hierarchical. This definition is considered by the NCHC Board of Directors to be a living document, which will be reviewed periodically as educational practices evolve. The National Collegiate Honors Council (NCHC) supports and values inclusive excellence by promoting educational equity and non-discriminatory practices. As an organization of institutions, honors educators, students, and staff, it is our responsibility to promote the inclusion and success of academically motivated and high-potential learners from all communities, understanding that each of us holds varied, intersectional identities. We make inclusive excellence possible by understanding that differences between and among us are strengths. In response to historical, cultural, and institutional restrictions that have limited student access to honors education and the hiring of diverse faculty and staff, the NCHC is committed to modeling best practices in inclusion, and to using inclusive leadership strategies, research, and partnerships with other organizations to help honors colleges and programs pursue honors practices and programs that serve and empower all communities.